Purchasing a season ticket remains the cheapest way of attending all of our home league games at The Mem next season. We are delighted to announce the addition of a new seated Family Stand that will be constructed on the North side of the East terrace. This new seating area will be covered and will provide a great viewing perspective of the game as an alternative to the Family Enclosure for those who wish to be seated. Tickets within this stand can only be purchased with an U-16 or U-11 season ticket. Existing season ticket holders who wish to upgrade to this stand can do so from Wednesday also. Tickets will remain affordably priced for all Junior season tickets, with U-11 prices starting at just £1.00 per game and U-16s able to purchase a season ticket from just over £5.00 per game. All Junior season ticket holders will automatically be enrolled in the Young Pirates Junior Supporters Club. The cost of an Adult season ticket begins at under £13.00 per game with Over 65s and U-21s starting at just over £6.50 per game. Renewing your season ticket could not be easier and there are three main ways you can do so, the easiest way being online at www.brfctickets.com. However, supporters can still purchase in person by visiting the club shop at the Memorial Stadium, or over the phone by calling our team on 9096648 option 1. In order to ensure that your season ticket can remain affordable, we are delighted to once again be linking up with Zebra finance to allow supporters to spread the payments through our Direct Debit scheme. In line with some of our club changes, this process is now easier than before and can be completed online at www.seasonticketfinance.com/bristol_rovers. In addition to the above, there is also one other significant change for next season, in that the club will now be switching to electronic access from the 2018/19 season. This will mean that season ticket holders will receive an electronic card, as opposed to a paper booklet. Due to this, the window to purchase season tickets is shorter than in previous seasons, as these will need to be produced and mailed out ahead of the new campaign. 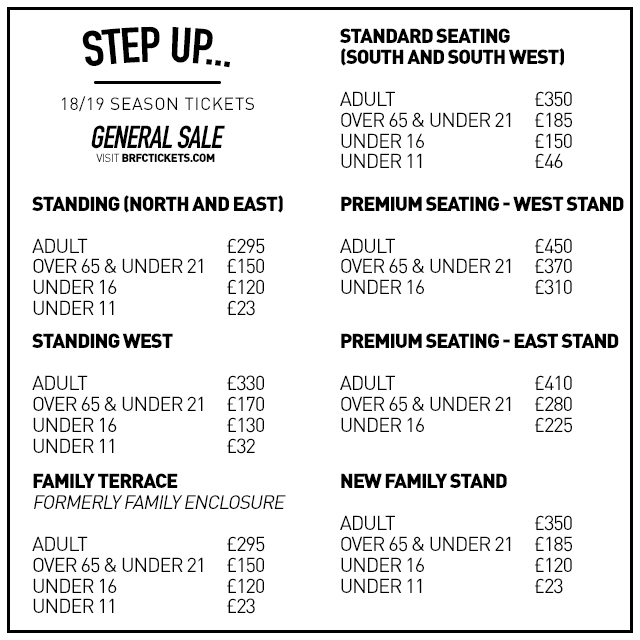 Prices for each area of the ground are listed below. Please note, that with the closure of the Supporters Club Shop in Kingswood no season tickets will be available from the Supporters Club. However, supporters wishing to renew their Supporters Club membership, can do so when purchasing through any of the above channels. We ask all supporters to please ensure that their contact details are up to date on our ticketing system whichever means they choose to renew by. We would like to thank you all for your continued support and we look forward to seeing you all back at the Memorial Stadium for the 2018/19 season. For a list of FAQ’s about purchasing a 2018/19 season ticket, please click HERE.